Hey rural Vermonters, your broadband internet connection is horse-powered! One problem with living out in the boondocks is it can be difficult to receive services that we city-folk enjoy without a thought. When electric wires were spreading across the nation in the first half of the 20th century, rural areas were not prioritized because it cost power companies way more than they would earn from the scant population there. Victory and Granby, two towns in the Green Mountains of Vermont, for example, didn't have electricity until 1963. The same thing is happening with fiber-optic cables bringing internet access that doesn't require a dial-up modem. Gov. Peter Shumlin has promised that every home in the state of Vermont gets broadband internet, but in order to reach the homes in the extremely rough terrain, the utility company FairPoint employs a technology that has been around for centuries. 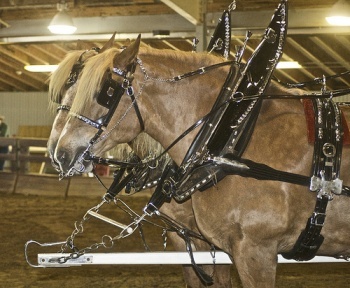 Meet Fred, the 14 year old draft horse that's bringing internet to hard to reach places. The funny thing is that Fred's owner, 67-year old Claude Desmarais, has been laying cable with a draft horse for three decades. It seems that the only way to bring big heavy spools of 48-fiber optical cable into the muddy foothills of Vermont is with the sure steps of a 1,700 lbs. Belgian draft horse. "We could maybe get a four-wheeler in here," says one of the linemen on Desmarais's team, but a truck would be impossible and would leave indeliable marks on the terrain and frown on the faces of residents. Even to get internet access, a Vermonter would probably frown on a huge truck plowing through their yard. A visit from Fred is much more palatable. I love the anachronism of a draft horse using ancient technology to bring perhaps the greatest innovation of the last twenty years to people in hard to reach places. Seems somehow fitting. When will robotics finally eclipse the horse for tasks like this?